Ever planned on meeting friends but cringed at the thought of ending up in a loud overcrowded bar, shouting out all your conversation to compete with the blaring music? Well cringe no more. 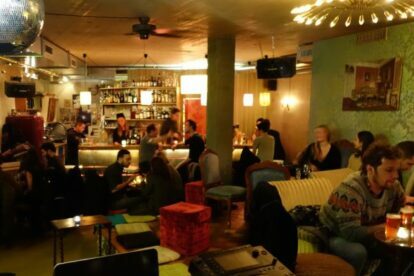 Staying true to its name, the Wohnzimmerbar (living room bar) delivers the relaxing cosiness of home – comfy sofas, good glasses of wine, easy music – while providing you with the out-of-home environment you want from a bar. Originally situated near the Langstrasse, the re-opened/re-designed Wohnzimmerbar now takes up residence in the super-hip Kalkbreite building. And with one of its windows looking directly inside the tram depot, it’s always nice watching first timers jump slightly when 50 tons of metal pass by a few meters from where they’re standing. Never empty but never too full this is a perfect bar to start the evening, meet friends for a quick beer or just sit back and enjoy a concert (Sundays). Best living room ever.